FOC is a plug-and-play Ethernet Media Converter. Its operation is defined by some micro-switches. The optical interface may be either fixed or a pluggable SFP module. 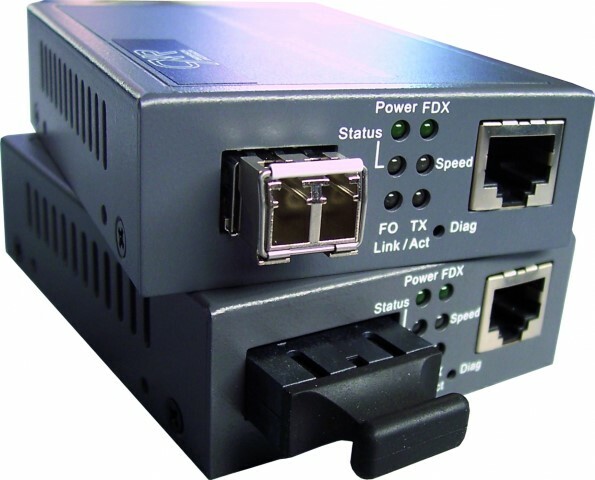 FOC runs as a transparent fixed speed Ethernet/Gigabit Ethernet converter (100BaseT to 100FX or 1000BaseT to 1000SX/LX) or as a 2 ports store and forward switch with rate adaptation (10/100BaseT or 10/100/1000BaseT). The 'Link Alarm' feature shuts down the copper interface when the optical link is off, or vice-versa, shuts down the optical interface when the copper interface is disconnected. As pure fixed speed converter, the FOC provides a 200 Mbps or 2,000 Mbps full duplex bandwidth and supports Jumbo frames up to 9,216 Bytes. The FOC is VLAN transparent in all modes. The FOC is powered from an external 110/230 Vac to 5 Vdc adapter or an optional 48 Vdc to 5 Vdc converter. FOC products can fit into a RACK-MEDIA16 chassis that holds 16 modules. This chassis provides single or dual power supply modules and 3 fans for converter cooling. Single fiber, or WDM converters: WDM products work in pair, one unit is W13 (with 1310 nm TX) ad the other unit is W15 (with 1550 nm TX).